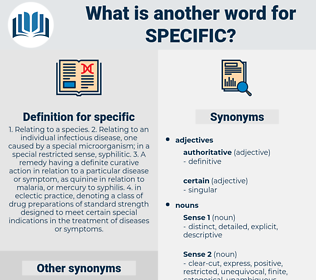 What is another word for specific? species-specific, issue-specific, specialised, tangible, site-specific, exact, case-specific, fixed, well-defined, actual, treaty-specific, specifically, non-specific, special-purpose, idiosyncratic, project-specific, women-specific, prescribed, definitive, respective, identifiable, in-focus, specialist, specified, explicit, fine-grained, tailored, substantive, host-specific, mission-specific, specifications, pinpointed, one-off, preset, factual, focussed, typical, substantial, clear-cut, realistic, concise, tailor-made, express, sharp, characteristic, specialized, committed, thematic, meaningful, established, corresponding, genuine, disease-specific, tissue-specific, straightforward, strict, qualified, real-life, direct, such, unambiguous, particulier, applicable, indefinite, unspecified, professional, strange, punctual, pragmatic, detailed, inherent, solid, accurate, Specifying, singular, few, generic, refined, ad-hoc, decisive, deliberate, careful, well-targeted, correct, selective, comprehensive, practical, focused, pertinent, narrow, extenuating, isolated, Sectoral, connection-specific, concerted, distinguishing, self-explanatory, several, topical, timely, real-world, categorical, privileged, very. requirements, outlines, special, Organizations, specifically, specified, specialized, detailed, accurate, practical, focused. characteristics, purposes, perspectives, Particularities, targets, types, aspects, audiences, levels, Guidelines, exposures, limits, Duties, rules, merits, methods, actions, markings, gatherers, points, Forms, Entries, problems, Parties, requirements, specifications. specificity, specification, specifically, specialist, specified, explicit, express, characteristic, particulier, precision, target, accurate, speciality, practical. implementing, Arising, Pertaining, Requiring, setting, Promoting, learning, hitting, taking, according, Specifying, extenuating, distinguishing. confined, articulated, Earmarked, specified, tailored, focused. expires, includes, helps, applies, steps, notes, becomes, Does, special, PROPRES. unreliable, indefinite, similar, commonplace, ordinary, unlimited, Resembling, common, uncertain, standard, undefined, indistinct, normal, usual, fuzzy, vague, careless, like. circuitous, obscure, nonexclusive, incomprehensible, pandemic, equivocal, inaccurate, ambiguous, inexact, cryptic, generalized, unspecified, unintelligible, implicit, imprecise, incorrect, enigmatic, dark, implied, broad. But the distinction is general and relative rather than specific and absolute. 2022. Food of specific sorts is rarely, if at all, mentioned in the poem. spice bush, savoy cabbage, Sphecius Speciosis, spicebush, subspecies, subspace, swap space, sheep's fescue. medicine, medication, medicinal drug, medicament.